I love Ching Chou Kuik's artwork. And I was lucky enough to win some Pyramage and Decoupage sheets featuring her beauties from The Crafty Purple Frog on the Craftalicious challenge blog. I printed her out on 110# white cardstock, ran through the Cuttlebug with the Spellbinders Beaded Ovals die, sponged Distress Crushed Olive and Forest Moss in the bead area and added some amber rhinestones in alternate ovals. I layered it onto a dark blue cardstock run through the Cuttlebug with the butterfly swirl pattern embossing folder from the Heritage pack, then onto my main cool yellow card. 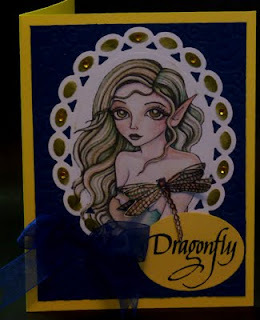 Stamped the word Dragonfly (Quietfire Design) on another piece of the yellow and die cut it with a regular oval shape. Added the dark blue gauze ribbon. Printed out the dragonfly, cut it out and touched it with some iridescent medium (hard to see in the image) and adhered the body only to the one on the image. This is so gorgeous, Yogi. I'm so glad you went into detail how you did it. I always learn something when artists tell what steps they took. 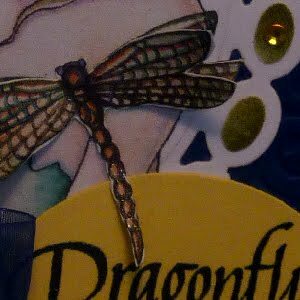 I love all the parts of this beautiful card and the dragonfly with iridescence is so special. I don't know if I'll get to this challenge or not since Tuesdays are so busy for me. I can see why you are pleased the card has turned out lovely, thank you for joining crafts and me this week. Good luck! You can have a chance to win more sheets on my new Crafty Purple Frog Challenges blog and go for the DT if you want. Totally awesome Yogi! Amazing images and your details are over the top! This is a beautiful card Yogi. I like all the elements and layers you used. OMG - Your project just took my breath away - WOW!!! Thanks so much for working the corner with The Crafty HOs! :D MWAH! What a great Card. Thank you so much for joining us for our latest Challenge over at the Crafty Hos Challenge Blog! We hope you will join us for our sketch challenge this week. Thanks again and have a great Sunday!